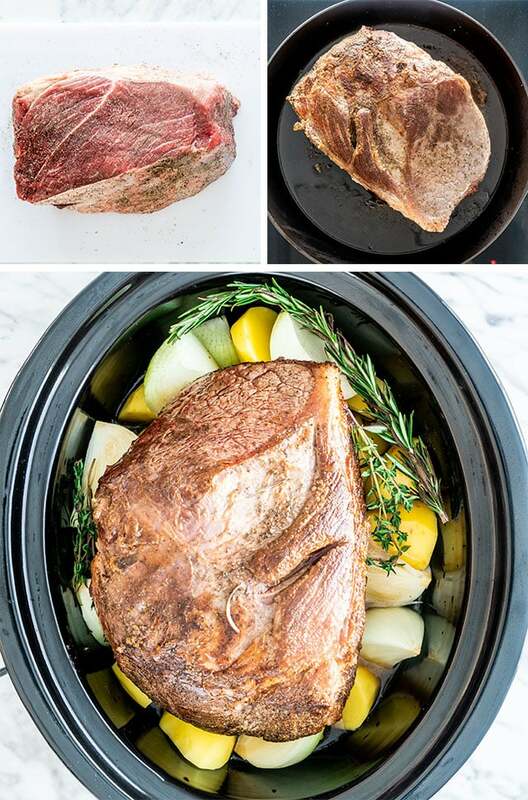 A fool proof recipe for The Best Crock Pot Roast. Fall apart tender beef that’s been deliciously seasoned, served with carrots and potatoes! 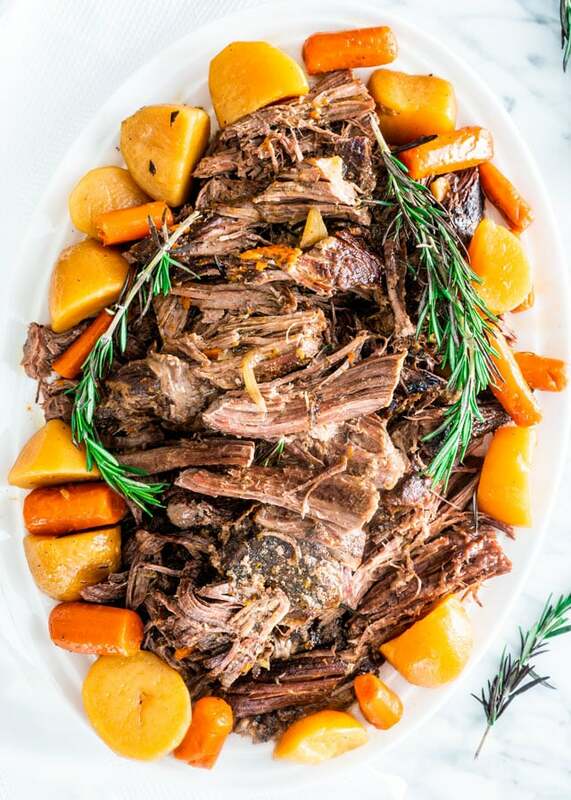 I’m so excited to finally share this Crock Pot Roast recipe with you, because it’s insanely easy to make and utterly delicious. The great thing is you’ll have leftovers for a few days. 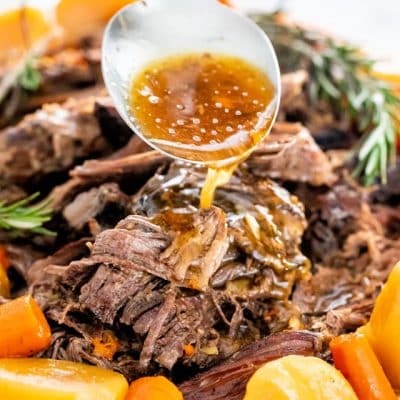 This Crock Pot Roast is a true comfort dish, a classic family meal that everyone enjoys. The slow cooker is ideal for easy recipes that you can prep the night before and turn the pot on in the morning before you go to work. When you come home at night, not only will your house smell incredible, but you’ll have the most delicious meal ever. Pot Roast is a method of cooking a cut of meat. This method involves taking a big cut of beef, brown it on all sides and slow cook it with broth and aromatics until fall apart tender. Pot roast is really a braise that cooks at a low temperature for a long period of time. This is why a slow cooker is perfect for making pot roast. The best beef cut is a tougher cut that are lean with lots of connective tissues and very little fat. 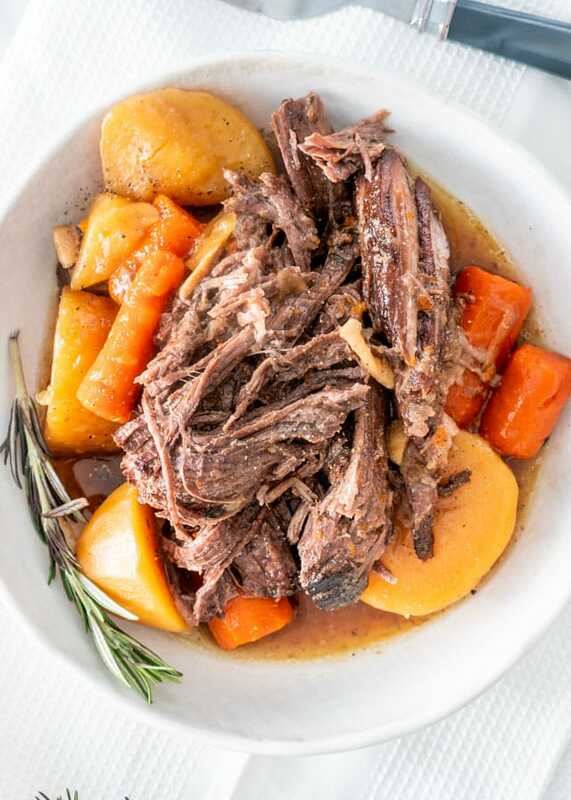 When pot roast is cooked properly, the collagen breaks down into gelatin, thus tenderizing the meat. Best cuts include chuck roast from the front portion of the animal. Brisket which is from the breast and is very lean. Also round which is from the rear leg. Season the meat generously with salt and pepper on all sides first. Do not add the meat to the slow cooker without browning it first. This creates a delicious crusty exterior. Make sure you brown your meat on all sides. Use a cast iron skillet for best results. Chop vegetables and add them to your slow cooker. I prefer Yukon Gold potatoes because of their butter texture. They also hold better in the slow cooker and don’t get all crumbly when cooked longer. You can also use Russet potatoes. I prefer to cook my pot roast in the slow cooker on low for 10 hours. I find that makes the most tender meat. However, 8 hours on low should be good enough as well. You can cook it on high for 4 to 5 hours. If you don’t have a slow cooker, don’t fret. You can also make this delicious pot roast in your oven. I would use a large Dutch oven. Dutch ovens are great because you can sear your meat directly in it, and then transfer it to the oven. You’ll need to cook this at 350 F degrees for about 3 hours or until the meat shreds easily with two forks. 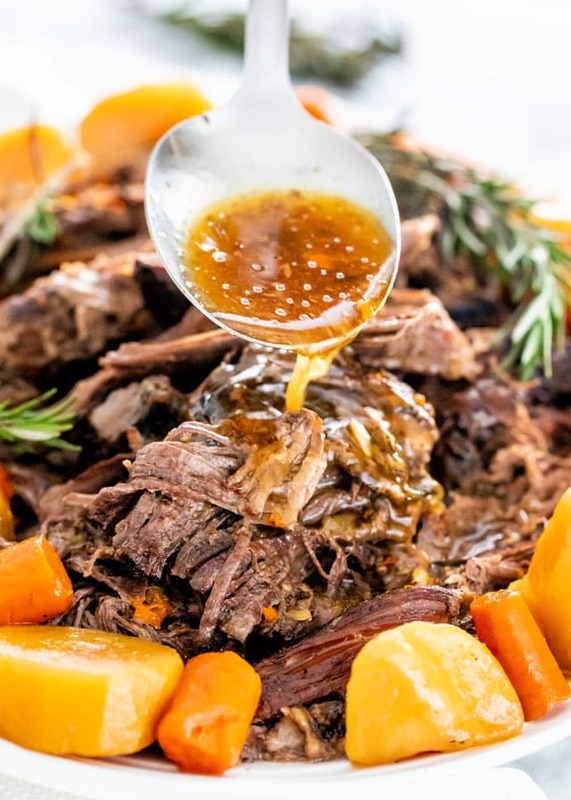 You can also cook this pot roast in your Instant Pot. You will get the same results but in a lot less time. Use the Saute function to brown the meat first, then add the rest of the ingredients. Cook on Manual (high pressure) mode for 80 minutes. 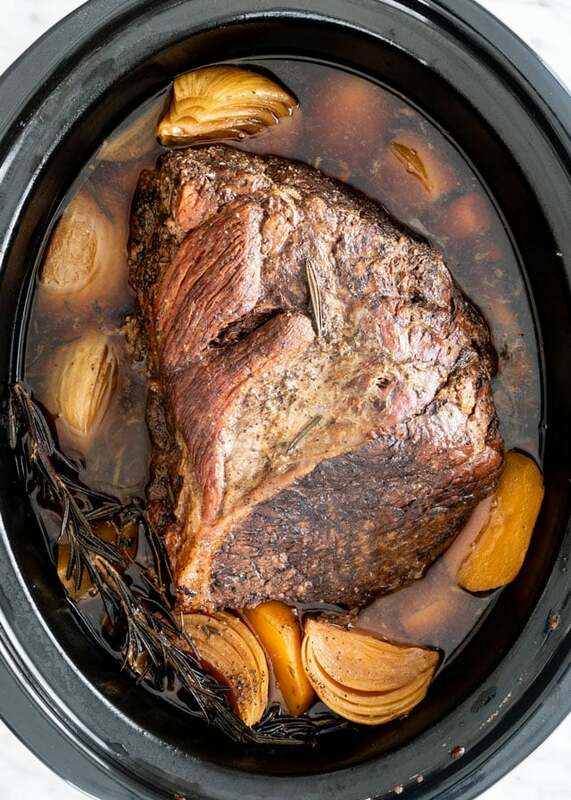 A fool proof recipe for The Best Crock Pot Roast. Fall apart tender beef that's been deliciously seasoned, served with carrots and potatoes! Season the chuck roast generously with salt and pepper. Use your hands to rub in the salt and pepper in all the cracks and crevasses, to ensure maximum flavor. Heat the olive oil in a large skillet over medium-high heat. Add the chuck roast to the skillet and sear on all sides until brown. About 4 minutes per side. Transfer the pot roast to the insert of your slow cooker. Add the potatoes, carrots, onion, and garlic, beef broth, Worcestershire sauce, and herbs to the slow cooker. Cover and cook on low for 8 to 10 hours or on high for 4 to 5 hours, until the roast is tender. Transfer the pot roast to a platter and let it rest for 15 minutes. Discard the herbs from the slow cooker. Use a spoon to skim any visible fat from the surface of the liquid. Whisk the cornstarch with the water and add to the slow cooker. Stir everything together and cook on high for 20 minutes or so until the sauce thickens up a bit. Add more cornstarch if you're looking for more of a thicker gravy. Slice the beef or shred it with a couple forks. Serve the beef with the potatoes and carrots and drizzle with gravy. Preheat your oven to 350 F degrees. Season the chuck roast generously with salt and pepper. Use your hands to rub in the salt and pepper in all the cracks and crevasses, to ensure maximum flavor. Heat the olive oil in a large Dutch oven over medium-high heat. Add the chuck roast to the Dutch oven and sear on all sides until brown; about 4 minutes per side. Add the potatoes, carrots, onion, and garlic, beef broth, Worcestershire sauce, and herbs to the Dutch oven. Bring to a simmer, cover with lid and transfer to the preheated oven. Roast for 3 to 4 hours until the meat starts to fall apart. Transfer the pot roast to a platter and let it rest for 15 minutes. Whisk the cornstarch with the water and add to Dutch oven. Stir everything together and cook on high for 5 minutes or so until the sauce thickens up a bit. Add more cornstarch if you're looking for more of a thicker gravy. Turn the Instant Pot to the saute setting. (See your manufacturer's guide for detailed instructions on how to use your instant pot). Add the olive oil and wait for the oil to heat. Add the chuck roast to the Instant Pot and sear the meat on all sides. About 4 minutes per side. Add the potatoes, carrots, onion, and garlic, beef broth, Worcestershire sauce, and herbs to the Instant Pot. Close the lid (follow the manufacturer's guide for instructions on how to close the instant pot lid). Set the Instant Pot to the Manual setting and set the timer to 80 minutes on high pressure. Once the Instant Pot cycle is complete, wait until the natural release cycle is complete, should take about 10 to 15 minutes. Follow the manufacturer's guide for quick release, if in a rush. Carefully unlock and remove the lid from the instant pot. Transfer the pot roast to a serving platter, and let it rest for 10 to 15 minutes. Turn the Instant Pot to the high saute setting. Whisk the cornstarch with the water and add to the Instant Pot. Stir and cook for 5 to 10 minutes or until the sauce thickens a bit. I am cooking the roast in a crock pot on high for 5 hours and the meat is still tough? Do I keep cooking it longer? If it’s not shredding, then leave it for a bit longer until it does. Hi, Thank you so much for this recipe. If cooking a 2 lb roast in instant pot, do I decrease the time? Thanks! It really depends on how you want it done, but I would still cook it for at least 40 minutes. This is the first thing I cooked in my new crockpot. I followed the recipe exactly and turned out good. Thanks for sharing it. In Texas we use Shoulder Arm but often sub Brisket which is good if cooked long enough. Hi Jo, just wanted to say thanks for having multiple options. My slow cooker runs hot so I don’t use it and as I read down further I saw you also included instant pot! I like that your recipes can be achieved by several methods. I have not made it yet but it’s now on my list. Thanks! My pleasure, Lynda! Do let me know if you make it and how it turned out!